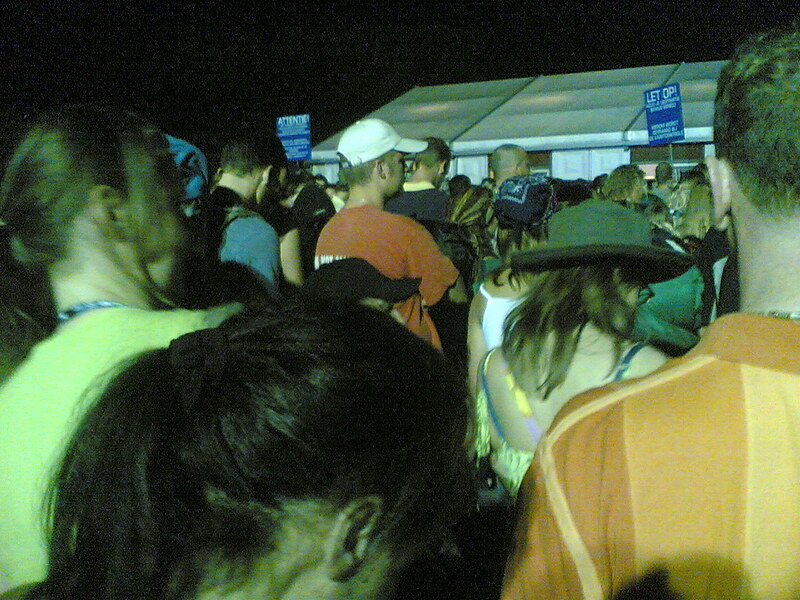 August 2001 is when I last used my tent and made a pilgrimage to hallowed ground near Biddinghuizen where annually is held the Lowlands festival. This sacred place (right next door to Wallaby World) is attended by 50,000 of the most faithful followers of good music and outside camping. This year a group of 11 people went. Who will be designated A, B, C, D, I, J, N, P, R, S, and T. Or referred to by their names: Peter, Catherine, Rebecca, Nadja, Ian, Trista, Dave, James, Sarah, Ben, Andrea (not in that order). The advance party (consisting of ABCJNPRandT) arrived on Thursday evening having travelled on the train from Amstetrdam. From the train, there was a longish queue to wait for the busses especially laid on to ship the festivallers from Lelystad to ‘Paradise.’ The queue moved quite quickly and everyone was too excited with anticipation to be got down by it. Then came the coach journey, which lasted a lot longer than anyone had expected - longer than the train journey, but through this, spirits were high. We were all looking forward to the BBQ we had planned for the period immediately following the erection of the tents. Now there was an advance advance party consisting of N’s flatmate and several of her friends. They were intending to get in, set up a base camp and have us join as reinforcements later. Alas the best laid plans of mice and festival organisers very often gang a-gley. It seems everybody turned up Thursday late afternoon / early evening, and outside the door there was a huge throng of people doing what the Dutch would call queuing and most other people would call laying siege. But being mostly Dutch, it was a good-natured siege. Whereas in many places a riot would have ensued, here the people waited like refugees at the border. Impatient, but not daring to surge forward for fearing being turned back to the horrors of war, genocide or their day job. The mood in the throng was that of perseverance in adversity. Humour was relatively high and the sought-after prize of a new life in the ‘Paradise’ of Lowlands, as well as the barbeque we had planned, kept us going. It took us 4 hours to get into the camp. There was no ‘search everyone’ policy, just the logistics of trying to squeeze 10s of thousands of people through 8 doors one-at-a-time. We were unable to camp near the advance advance party as we needed an area big enough for us to be roughly together and with spare space for the not-so-advanced party. It was the wee small hours when we pitched out tent. Thank some wondrous deity it was not raining and we were soon tented and despite our tiredness, sat in a huddle hoping to prepare our much hoped-for feast. That same benevolent god can also mock. Due to some sort of design flaw or a lack of functioning brain cells at that time to understand the instructions, the disposable barbeque failed to take. Despite repeated applications of lighting fluid. We began to wonder was this coal or just black rocks. Eventually, we gave up: the coal was starting to glow a little, but it would be dawn before it would cook anything. Correction - tent was last used August 2002, not 2001.